A quick demonstration one lovely afternoon when the students requested I paint the beautiful Hydrangeas that were coming into bloom. I had not much practice with them beforehand but decided to apply my dark to light approach and I think it worked out quite well. Approaching different subjects in watercolour for me means using different techniques. Sometimes dark to light and other times light to dark. 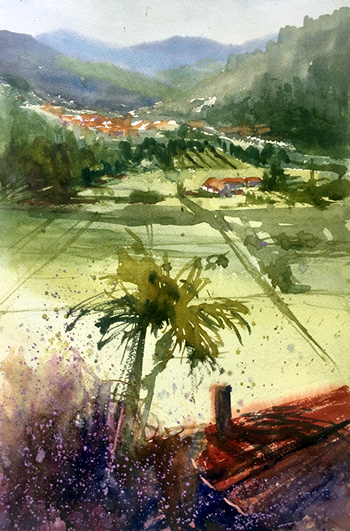 There are so many variables in watercolour, I like a full array of techniques to apply as the subject calls for. This was painted blissfully on a Saturday afternoon just after returning from my own personal time in the Tuscan countryside. I was so captivated by this approaching storm, but I needed something to place against the stormy sky. I love these trees with the canopy tops, so I added a tree that was in the area but not in my immediate visual field. It is important to remember that you can always borrow elements from what is around to make a story! 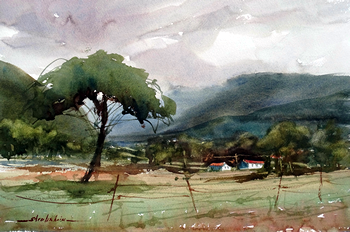 This was done en plein air as a group demonstration. It took me a few years to work up my nerve to tackle such a scene but this year I felt that I understood how to do it. I enjoyed painting it each week as a demonstration in technique but more than that, a demonstration in courage to try something that you think is beyond your reach. If we don’t try how will we learn? 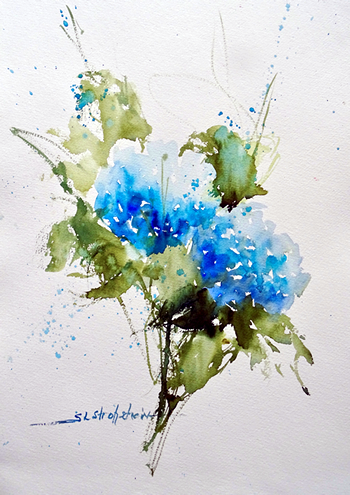 Sandra Strohschein is a self-taught watercolourist from Holland, Michigan in the USA, who has achieved remarkable success in a very short period of time. She began painting only in 2009 but has achieved a master level of work, spending easily 16,000 hours painting and travelling the world studying with modern masters. She has exhibited and been honoured in many juried fine art shows and her work can now be found in national and international private collections. Sandra works in a fast, loose impressionistic style of painting which is structured by solid art principals. She places a strong emphasis on composition, light, lost and found edges but paints passionate, emotionally charged paintings that are full of energy. Sandra also has a remarkable online presence, with thousands following her Facebook posts, which motivates artists to begin their own creative process on a daily basis. She's also an inspiring and sympathetic teacher and has taking been teaching workshops for the past couple of years. Sandra's teaching style is to demonstrate a painting from start to finish, usually in less than an hour. She talks through the entire process explaining her thoughts about composition, capturing light, colours, value changes.... everything that goes into the painting is clearly articulated as she paints. She says: "I am comfortable addressing questions while I am painting and encourage student interaction during my demos." Sandra says: "My method is fairly simple. Differing from many watercolourists, I often work from dark to light. This is a very direct method of painting which works very well for en plein air studies. I work from the top of the paper downward preserving my white highlights as I go. I use my paper as the palette letting the watercolour pigments mix themselves on the sheet as I introduce or suggest shapes with simple brush strokes. To see the interaction of the pigments merge and mingle on the paper....this is magic to me." "In the studio I often employ the more traditional method of painting which is to paint three washes. The first to capture light and local colour. The second to define areas with mid values. The third to add dry brush strokes to tie the piece together. Being a minimalist, my work is surprisingly simple and fresh." 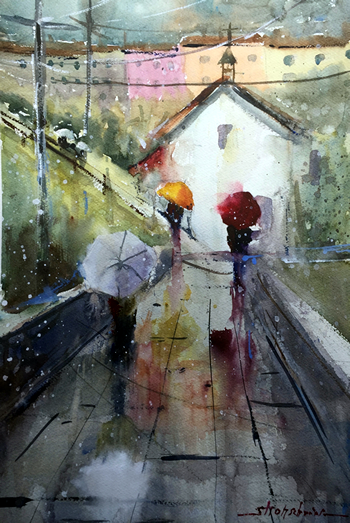 She adds: "I think what separates me from other watercolour instructors is my diversity in subject. Nothing is beyond my reach if I find myself inspired. And I have employed many different methods to get the results I am looking for. What works in one painting may not work in another. I am not limited by a formula. I know many different ways of approaching problems that watercolourists face. As well....I easily see what is missing in paintings and have a great ability to critique compassionately and foster artistic growth." "What I hear over and over again is how much fun people have in my workshops and how nobody ever wants them to end. I think that is a great thing.....to leave people wanting more." Sandra's course will include two demonstrations daily: one in the studio and one on location. The studio work will be painting demonstrations from photo references or life in a controlled environment where a student can actually learn about her process without being frustrated by changing elements outdoors. There will be an afternoon critique for those who are interested. Sandra says: "I have learned a lot about teaching from studying with Janet Rogers, Keiko Tanabe and Alvaro Castagnet. I believe that my relative inexperience teaching keeps me in tune with what a student is looking for in an instructor. Most importantly, I just want to render beautiful paintings clearly sharing my process and helping each student realize substantial personal artistic growth after studying with me." I am just back from an awesomely fantastic week at the Watermill, at Sandra’s painting holiday. I don’t have enough words to describe my experience and don’t know where to begin.